Interested in entrepreneurship? LinkedIn ProFinder connects top quality freelance or independent professionals with new clients and leads. Having a complete profile is the most important piece to getting opportunities, as it’s one of the first things potential clients will see. Profile photo – A professional picture is the key to making a good first impression. This image should be clear, warm, and memorable. Headline – It’s important to make sure that your headline matches the services that you originally selected on ProFinder, otherwise your specialties become unclear. Summary – Your summary is a great place to highlight your passions and accomplishments in your own words. This is a valuable section that helps you stand out. Clearly defines your role in the project and its completion. References to the skills utilized. The quickest way to build your brand is with LinkedIn’s publishing platform. You can write about anything from industry trends to career accomplishments. It’s important to write about what you know. This will help establish yourself as an industry expert since your content will be displayed on your ProFinder profile and available to all LinkedIn users (not just your connections). It may seem like an obvious statement, but it’s easier to get the job if you have done it before! Maintaining a portfolio of your previous work will demonstrate that you have the skillset to be successful. By keeping your profile up-to-date, future clients will be able to see what you’ve done and how you can help them. 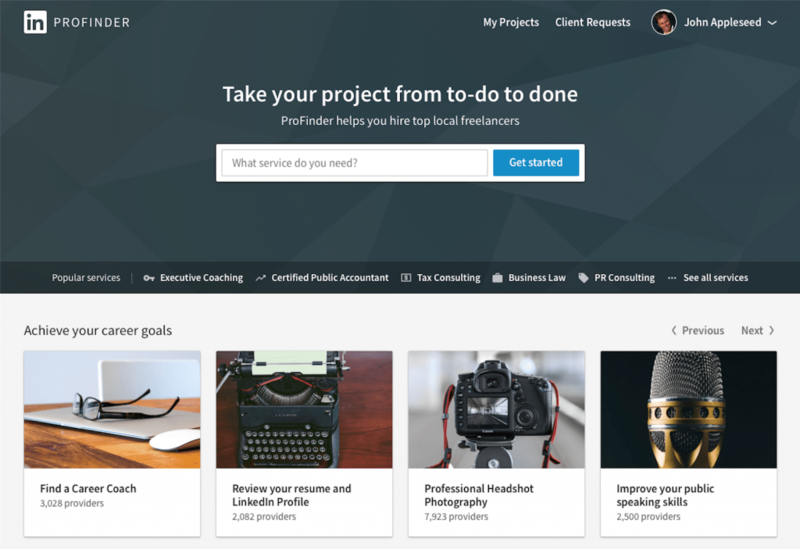 With LinkedIn’s ProFinder, you can be a part of the ~35% of freelancers in the workforce. Start picking up leads in no time with a well-crafted profile, a little bit of experience, and some help from previous customers. Remember that the early bird gets the worm, so respond to your requests for proposal as soon as you can!